Question: What is the construction of the second floor (floor). Is it 2X10, 2X12 or manufactured trusses? Plan 95281. Thank You. Answer: Hello – they are 2 x 10’s. Question: Is this a monotholic slab? If so what is the size of the footing and thickness of the slab. I want to make sure the plan will meet the local building code requirements. I live in Duncanville Texas if this helps. Answer: This plan shows a stem wall slab foundation (4” thick). The Footing is 16” x 8” with an 8” poured wall. You might need to make changes to meet your local requirements. Answer: Thank you for your inquiry. 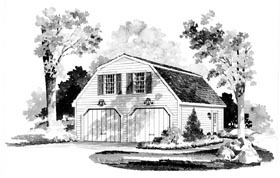 The garage doors are 9’-0” x 7’-0”.